Planning a family reunion, corporate or youth retreat, church trip, or wedding weekend in the Smokies? Whatever you need a large-group cabin for, our 6+ bedroom cabins in Gatlinburg and Pigeon Forge fit the bill. They’re packed with amenities like fully equipped kitchens, dining space for groups, spacious living areas, games, plenty of bedrooms with their own TVs, and more to make your group getaway better. The more the merrier, right?! These cabins perfectly match all of yoursearch criteria. 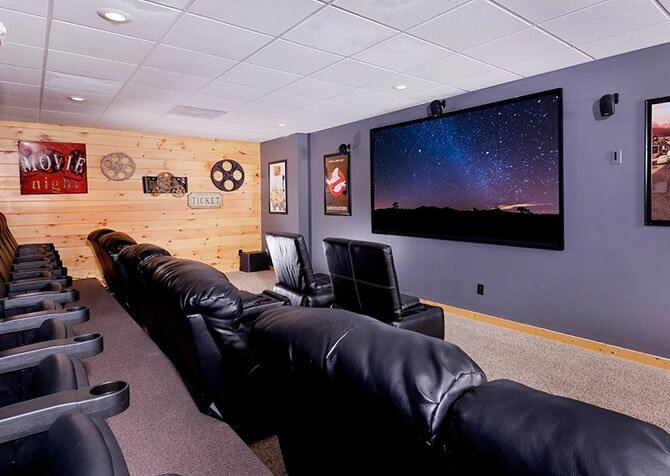 Guests will love relaxing by the indoor pool, shooting pool in the game room, and watching movies in the private cabin theater after trips to nearby Pigeon Forge. A large kitchen with double appliances makes cabin-made meals together possible! 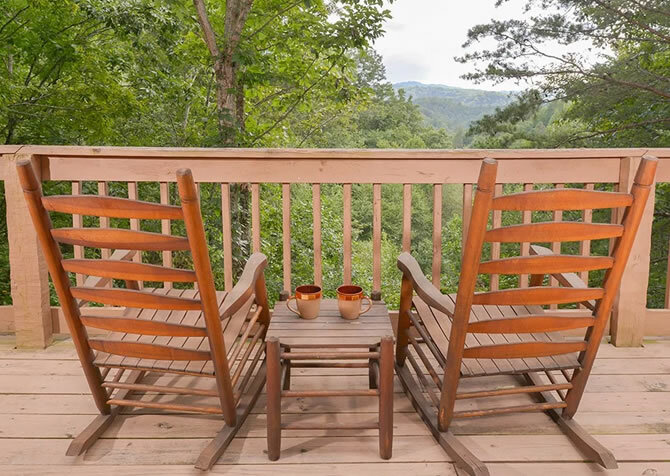 Spend time fellowshipping and catching up with friends and family while sitting on the deck with serene wooded views. 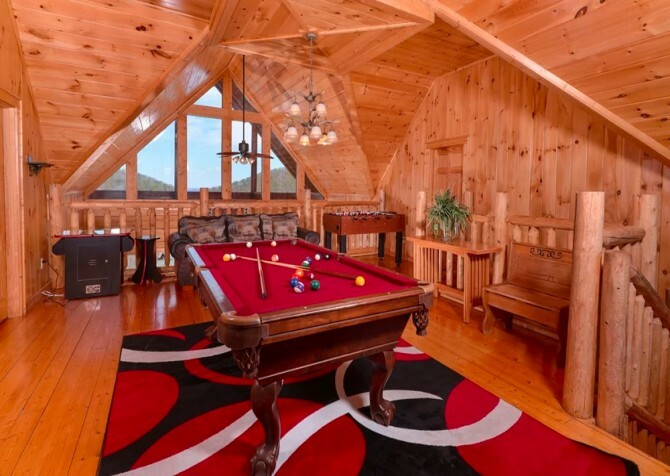 This 8-bedroom cabin in Gatlinburg boasts luxurious interiors, tons of amenities, and 10,000 square feet of space. Kids will love playing in the rec room, and adults will appreciate the fully equipped kitchen, beautiful bedrooms with views, and comfortable living area with stacked stone fireplace and plush sofas. With room for 29 guests, it's ideal for church retreats, family reunions, and group getaways. Traveling with a large group to the Smokies? Look no further than Bearfoot Landing for a comfortable and enjoyable Smoky Mountain stay. 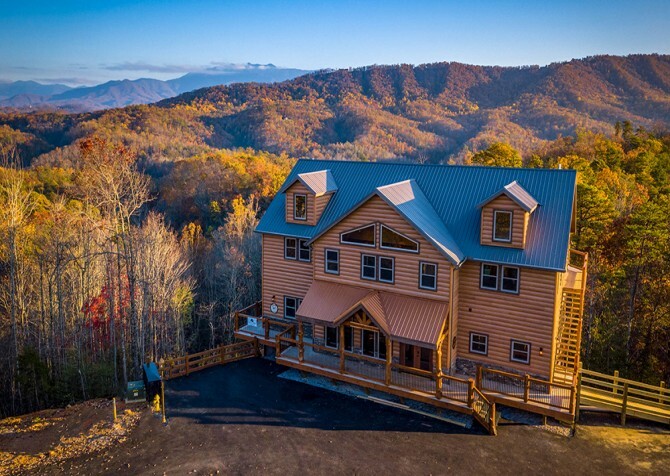 This 6-bedroom, 6.5-bathroom, 3-floor lodge for 24 features a fully equipped kitchen, 2 wraparound decks, an outdoor hot tub, TV in every bedroom, 5 king-size beds, a fun rec room with games, and above all — breathtaking Smoky Mountain views! 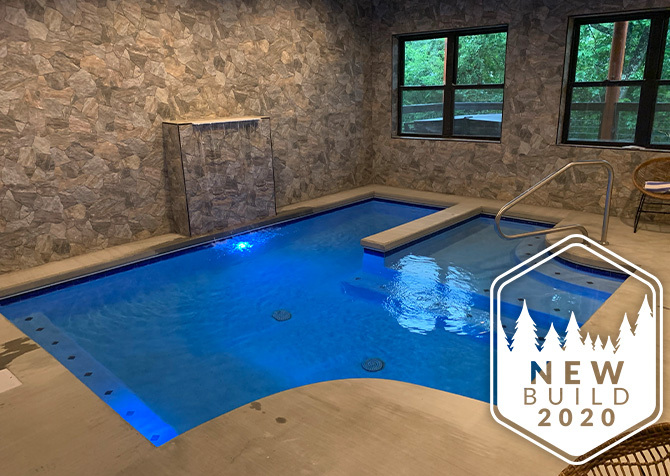 Built in 2017, Luxury Lodge is a fresh new space, providing a luxurious cabin experience with modern amenities, including a private indoor pool, 2 rec areas with games galore, an outdoor hot tub, and a private theater room. Just 5 minutes away from downtown Pigeon Forge, you and your group can easily head into the city for good food, fun shopping, and exciting entertainment! Surrounded by the Smoky Mountain trees, Keaton's Firefly Meadow offers privacy with no other cabins in sight. Take advantage of your secluded location by spreading out in the large, flat yard with a firepit and swings or soaking in the hot tub. It also offers a spacious rec room, multiple dining tables, an in-ground pool, and a convenient location close to 10 miles from downtown Pigeon Forge. Relax with family and friends at Smoky View Top Shelf, a 6-bedroom, 5-bathroom cabin that sleeps 16 —with abundant amenities and spectacular views in the Smokies. 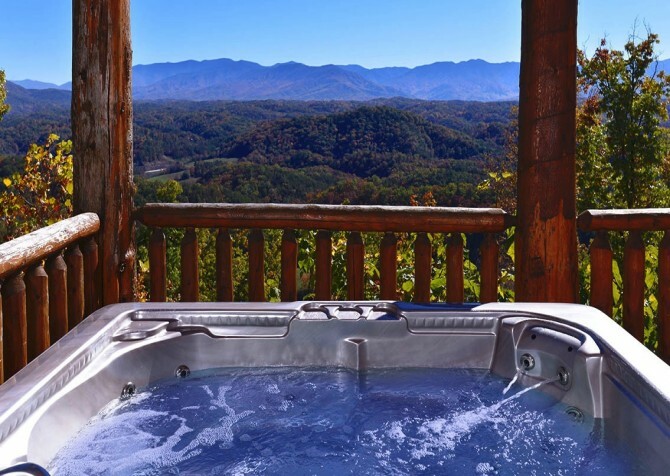 From soaking in the hot tub and unwinding by the fire to playing on the arcade units and counting stars from the 4 decks, a Smoky View Top Shelf stay means mountain memories aren’t far away! 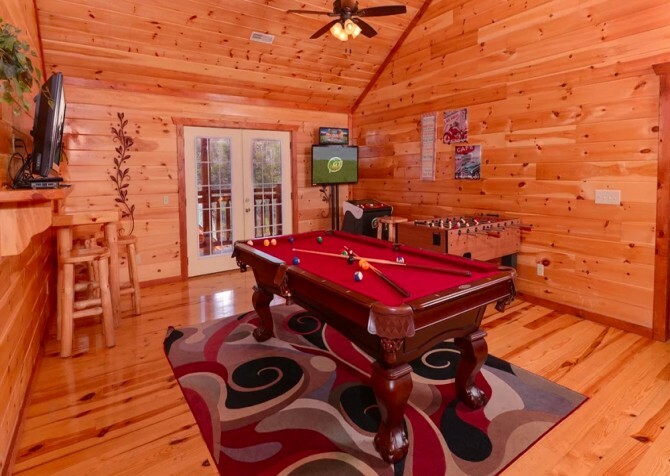 This large group Pigeon Forge cabin rental offers eight bedrooms and sleeps 46 guests. 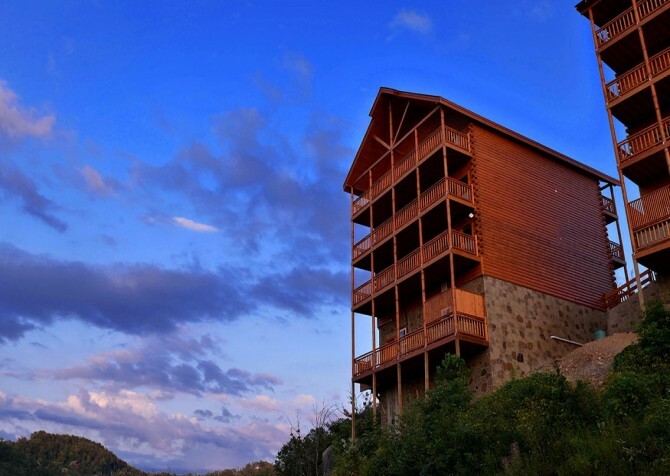 A great choice for a youth retreat or family reunion, you will marvel at the mountaintop view from the expansive deck. 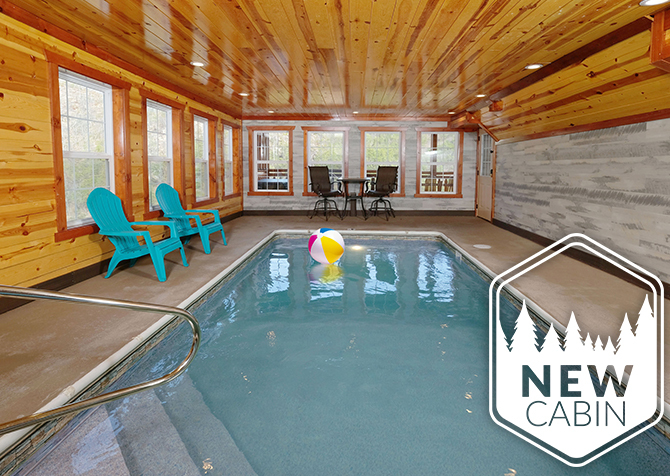 Handicap accessible with Internet access, multiple game tables, a kitchen with double appliances, and bunk rooms that the kids will love, Crestview Lodge is a fun and convenient escape for large groups. 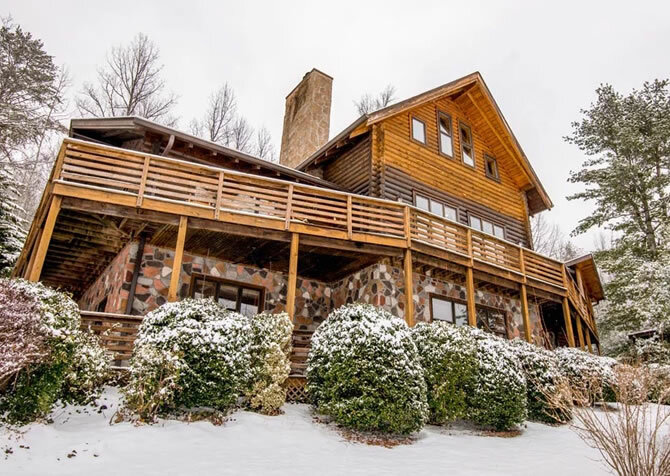 Harboring 8 bedrooms, 6.5 bathrooms, a large kitchen, an open dining and living area, 2 rec spaces, and peaceful wooded views, Wild Bear Lodge is a top pick for your large-group vacation. Up to 30 guests will enjoy watching entertainment on the big screen TVs and splashing at Hidden Springs Resort’s community indoor pool! Large groups need not cramp their style when they book Wild Turkey Lodge. 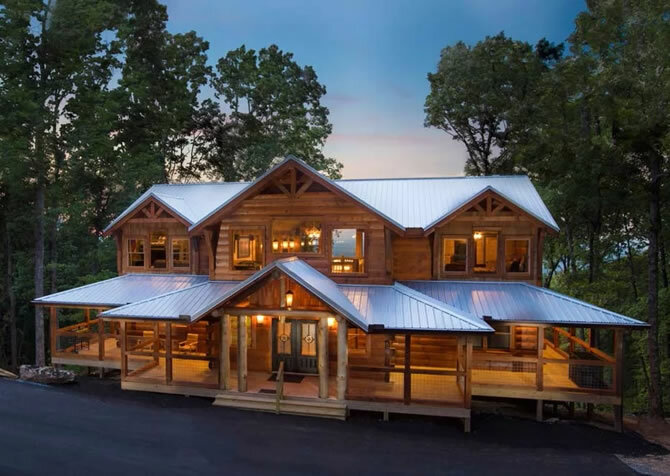 This 3-story cabin easily accommodates up to 24 guests and has more than enough modern comforts, including king-size beds, a TV in every bedroom, and an outdoor hot tub. 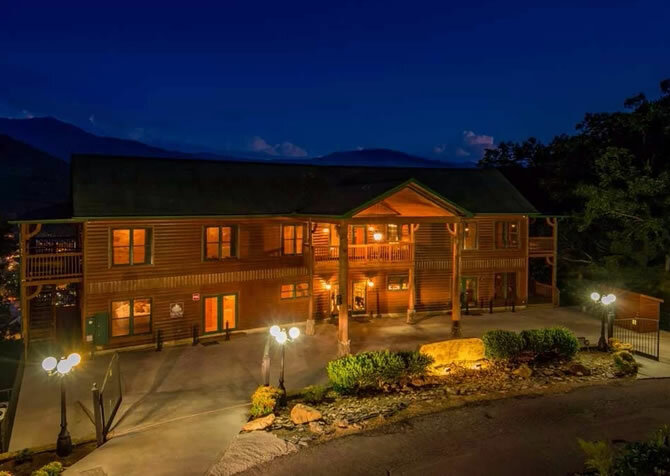 With stunning mountain views and a long list of exciting amenities, you won't regret checking in to this unforgettable Smoky Mountain retreat. 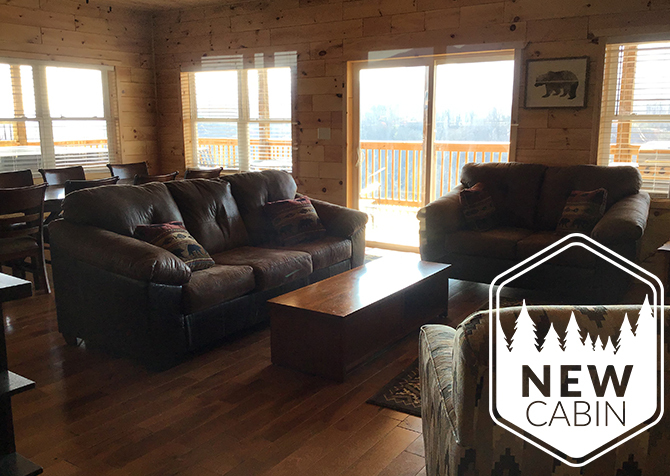 The spacious interior of Black Bear Lodge offers cozy spaces for up to 23 guests - and it's pet friendly. 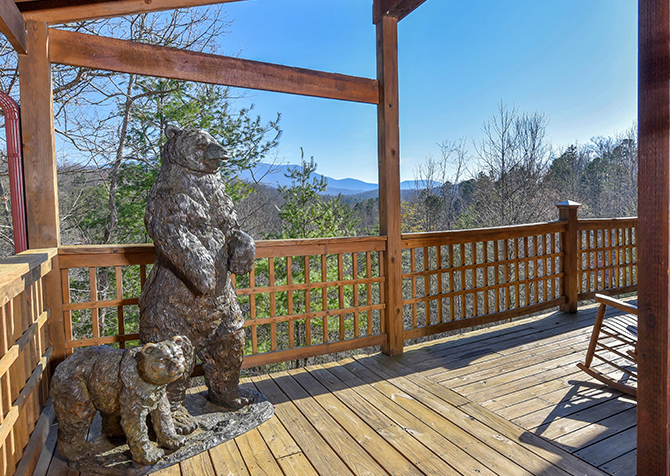 Besides the private bedrooms with luxurious updates, Black Bear Lodge boasts multiple game tables, an outdoor hot tub, a rocking chair porch overlooking the mountains, and a living room that doubles as a private theater. It's a great escape for a fun family vacation or a weekend with friends! Located near the Great Smoky Arts & Crafts Community, this 5-bedroom (+ loft), 3-bathroom Gatlinburg cabin has room to sleep up to 16 guests. It offers great amenities – a hot tub and indoor jetted tub, pool table, stone wood fireplace, and large deck – as well as conveniences you would have at home. From lounging on the sun deck, watching TV while soaking in the hot tub, and splashing around in the gorgeous private pool house – with a view – to cozying up in a king-size bed, playing arcade games, and having a movie night in the private theater, Smoky Mountain Manor has no shortage of ways to enjoy your time in Pigeon Forge. Pamper yourself in this luxurious getaway! 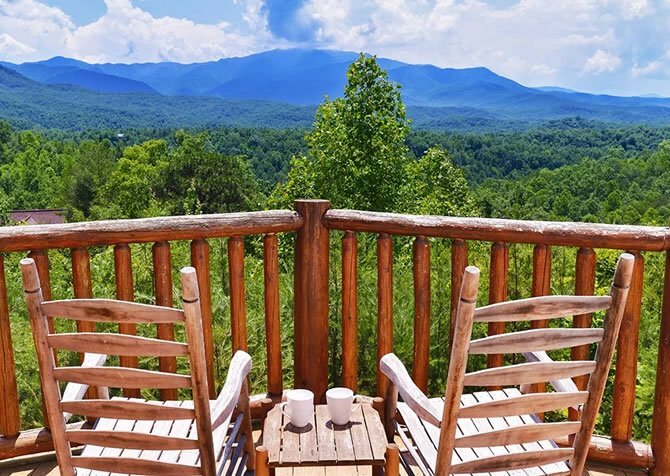 Ideal for retreats and big family vacations, Jennie’s View offers Smoky Mountain views from its position in the valley. Soak in these views from your rocking chair porch or outdoor hot tub before enjoying the many entertaining amenities inside 4,000 square feet of space. Easily house your large group inside this Pigeon Forge rental, and plan for group activities only miles away! This property is new to our program. Description coming soon! 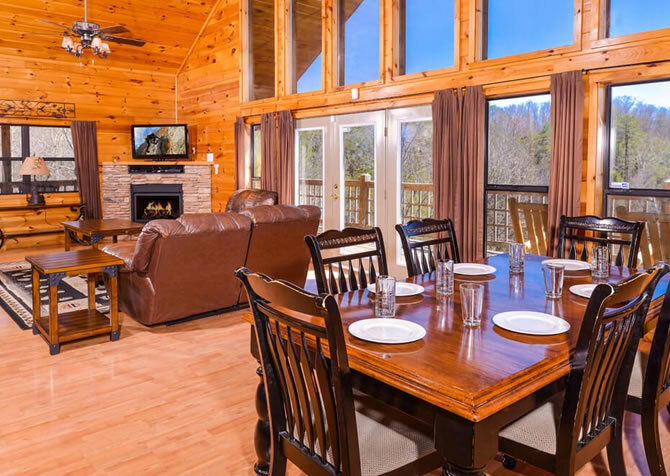 A 7-bedroom stunner, this lodge in the Gatlinburg Falls Hidden Valley Resort packs a punch for group getaways! Play in 2 rec rooms with tons of games, cook group meals with double appliances, and relax on 3 decks with hot tubs and TVs! Less than 5 miles from downtown Pigeon Forge is Jennie’s Cove, a 3,600-square-foot cabin in the Black Bear Ridge Resort. 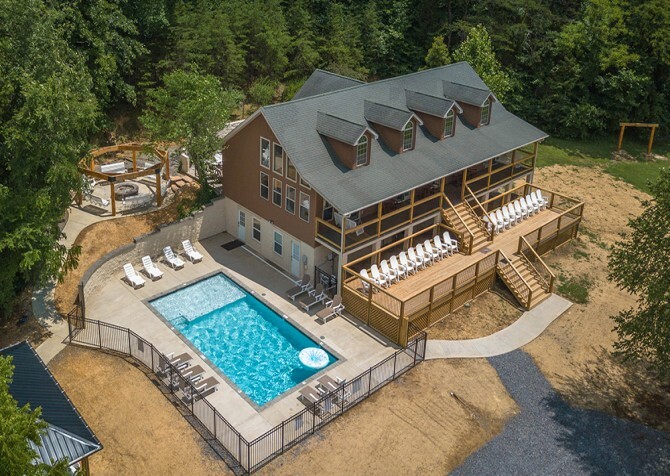 Ideal for large group gatherings, Jennie’s Cove features tons of entertaining amenities, 6 comfortable bedrooms with en suite bathrooms, lovely mountain views from multiple deck levels, and a convenient location less than 5 miles from downtown Pigeon Forge. Family get-togethers, corporate events, wedding parties, and church retreats can all find their home on the hill at Splash Mansion. This 11-bedroom, 11 ½-bathroom cabin has room for 38 guests and offers plenty of ways to keep everyone entertained. 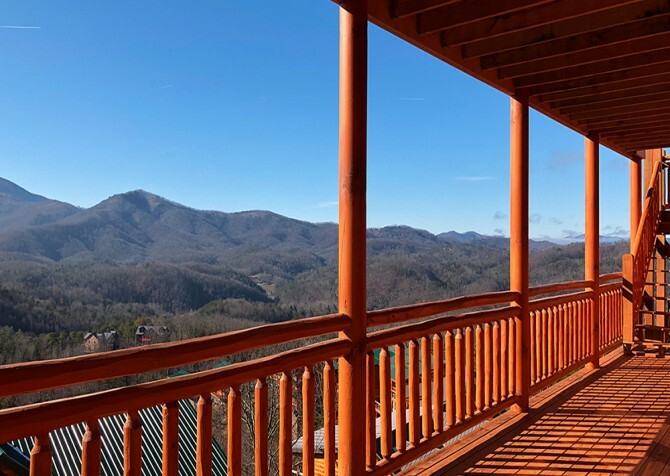 Enjoy multiple porches with amazing mountain views, a private indoor pool, a rec room with a variety of game tables, a theater room, and 2 outdoor hot tubs! 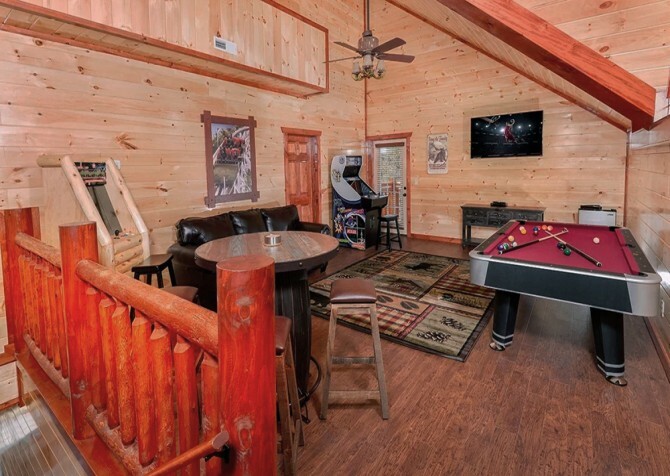 Loaded with fun for everyone, this 7-bedroom + 2 lofts, 7-bathroom Pigeon Forge cabin in Black Bear Ridge Resort is great for a family vacation or special group getaway. You'll find a private indoor pool, spacious theater room, rec room with game tables, high-speed Wi-Fi, and bedrooms that feature indoor jetted tubs and their own TVs for relaxing nights. 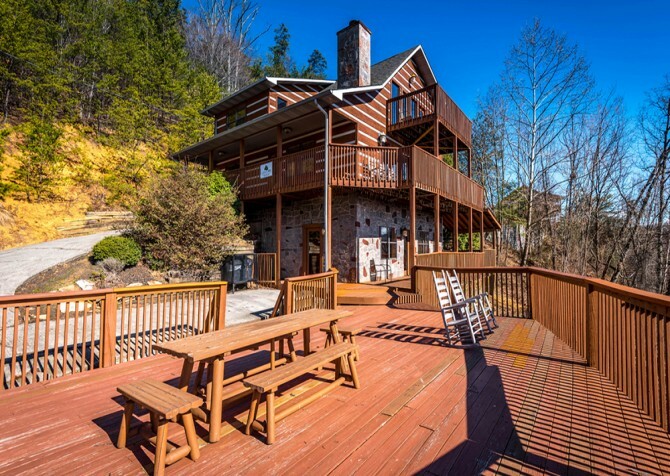 Located not far from downtown Pigeon Forge, Majestic Mountain Water is an 8-bedroom cabin with room for 22 guests. Great for group getaways and family vacations, it features a theater room, private indoor pool, outdoor hot tub, and spacious bedrooms with king-size beds and bunk beds. It also has a rec room with a pool table, air hockey table, arcade games, and a flatscreen TV! Less than 5 miles from downtown Pigeon Forge, this beautiful 8-bedroom Pigeon Forge cabin features room for 28 guests and lovely décor. 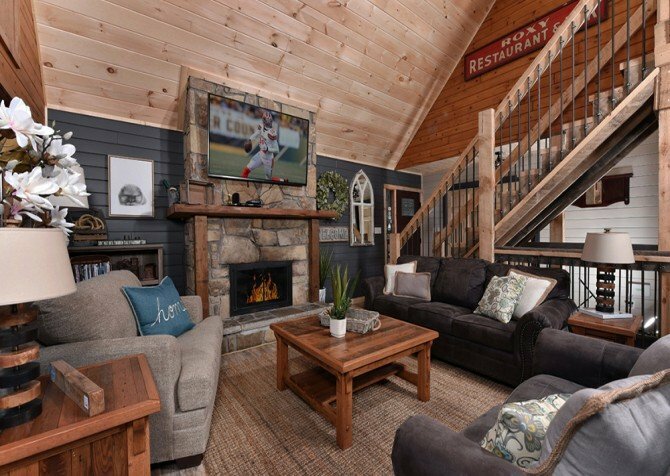 Blend stylish bedrooms and the comforts of home with tons of fantastic amenities, and you have an awesome Smoky Mountain escape for family and friends. 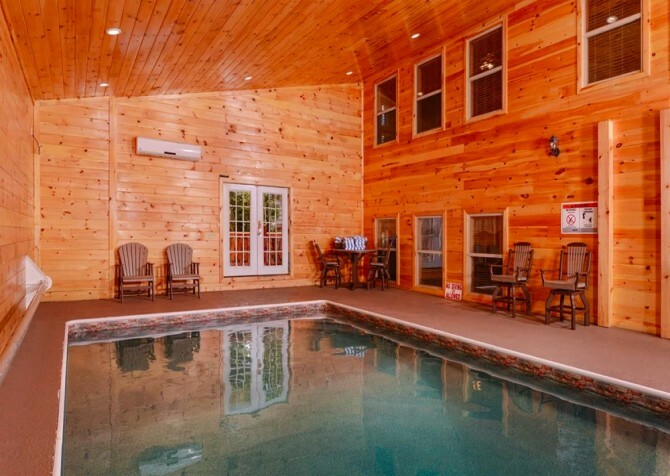 Enjoy a private indoor pool, theater room, rec room, and great mountain views. 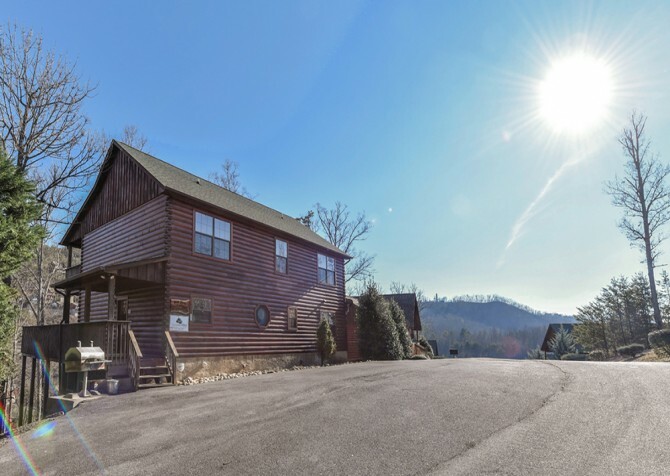 Located only 5 miles from downtown, Awesome Views Mountain Retreat is close to all the attractions, restaurants, and shops of the Great Smoky Mountains. 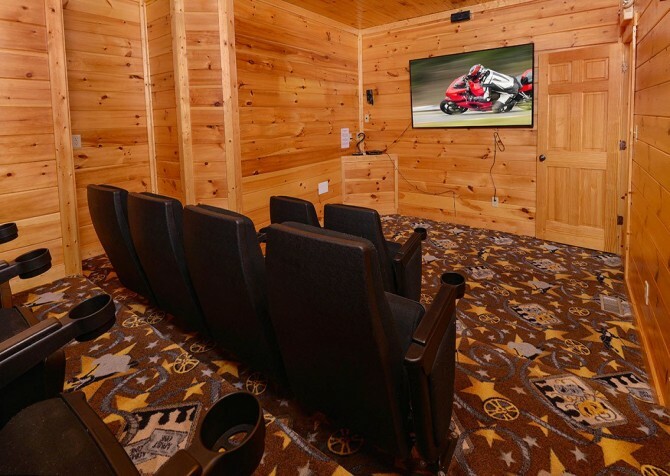 The 7-bedroom cabin features a relaxing outdoor hot tub, a fun rec room with a wet bar and game tables, a huge private theater with big screen TV, and plenty of deck space to relax in the great outdoors on cool mountain nights and sunny days. 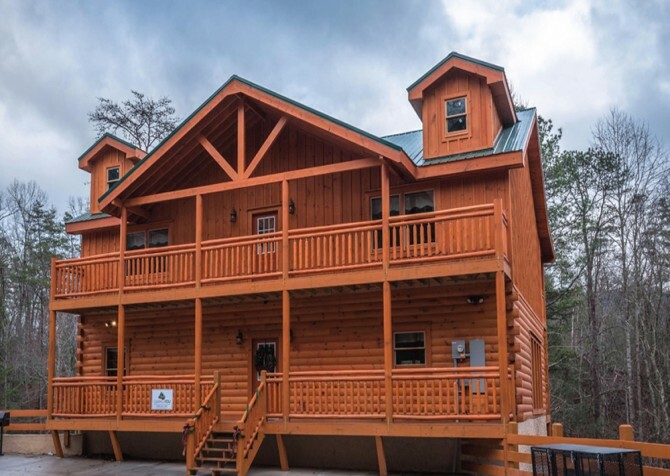 Group getaways come easy at Loose Moose, a spacious 8-bedroom, 8-bathroom cabin for 32 with beautiful Smoky Mountain views, a theater room, game tables, an indoor elevator, gorgeous wood interiors, tons of deck spaces, and so much more. Inside and out, this stunner in Pigeon Forge will impress for any reunion, big family vacation, retreat, or special occasion! Perfect for a group getaway with friends or a large family trip, Emerald and Evergreen at Sherwood sleeps up to 14 guests with 6 bedrooms and 6 ½ bathrooms. 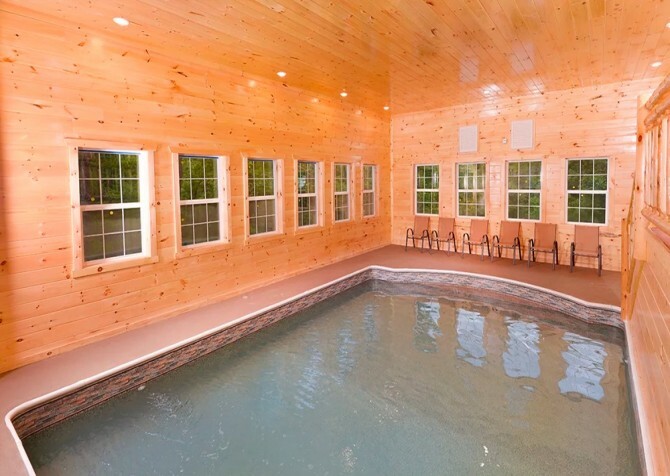 Featuring an outdoor hot tub, community pool access, home theater, rec room with a foosball table, and a TV in every bedroom, the good times won’t stop at this cabin in the Smokies! Less than a mile from downtown Gatlinburg, Aaron's Lodge keeps you close to the fun. It also boasts games and TVs throughout, and it's currently undergoing a makeover to give you a fresh, new space for 16 guests! 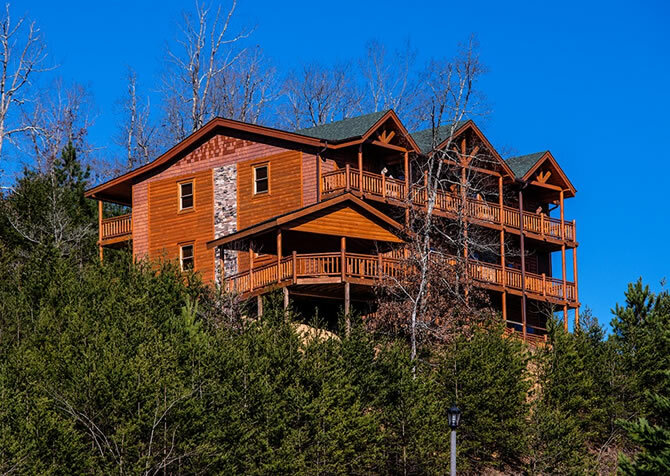 Located not far from downtown Pigeon Forge, Majestic Mountain Waters is an 8-bedroom cabin with room for 30 guests. Great for groups, it features a theater room, private indoor pool, outdoor hot tub, and spacious bedrooms with king-size beds and bunk beds. It also has a rec room with a pool table, air hockey table, arcade games, and a flatscreen TV - enough to keep kids and adults entertained! 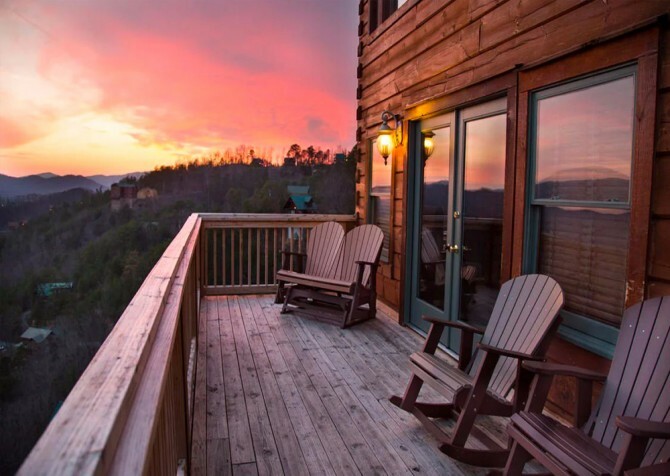 Pamper yourself with a luxurious vacation at this gorgeous Pigeon Forge cabin. Mountain Cascades Lodge offers high-end amenities and plenty of space. The decks and large windows showcase your lovely view, while the 7 bedrooms are inviting and unique. 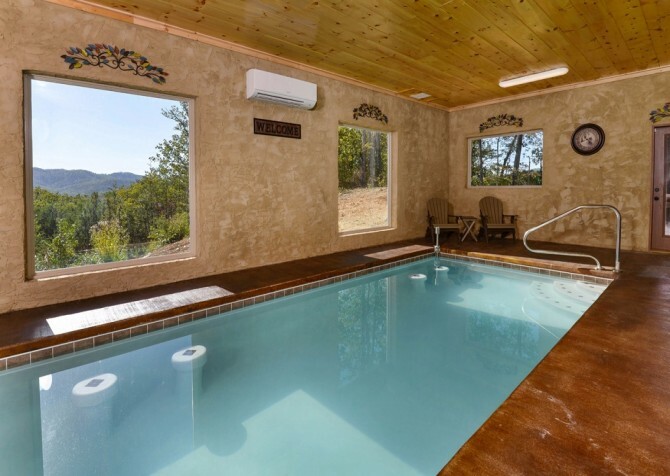 Mountain Cascades Lodge also features a private indoor pool, complete with bridge, small wading pool, and stone detail! 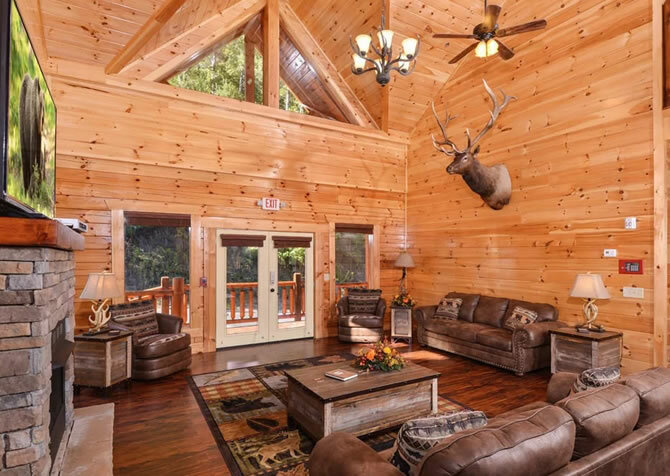 Accommodating a staggering 44 guests, this 14-bedroom, Pigeon Forge cabin offers tons of amenities and comforts for a large group getaway or retreat! A large kitchen with double appliances makes cooking for the group easy, the outdoor hot tub boasts fantastic mountain views, and game tables inside offer lots of entertainment. It's also just a short drive from attractions and restaurants to please everyone! Bearskin Lodge is cozy yet spacious, with room for 32 guests and spaces that feel like home. Curl up in front of the big screen TV in the living room, sit down for group meals in the large dining room, play pool and air hockey, have movie night in your own theater room, and enjoy 3 huge decks with wooded surroundings and fresh mountain air after busy days in the nearby national park! Up to 30 guests will love the updated décor and long list of amenities that come with Summit View Lodge. 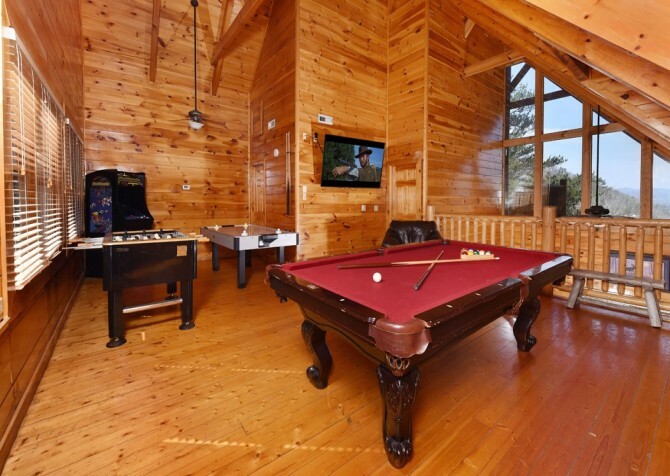 For a family reunion, retreat or weekend with all your friends, enjoy multiple game tables, 2 outdoor hot tubs, and stunning mountain views in this private Pigeon Forge cabin. Better still, you’re only a few miles away from popular Smoky Mountain attractions like Dollywood and the Dixie Stampede. 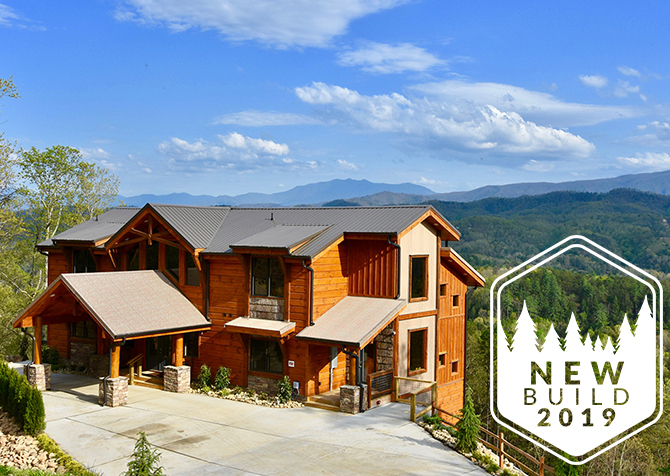 LeConte Bear Lodge is ideal for your next large group getaway, with 6 bedrooms and plenty of space for family and friends. There are also plenty of ways to stay entertained, with multiple game tables, a private theater room for awesome movie nights, an outdoor hot tub for relaxing, and community pool access. 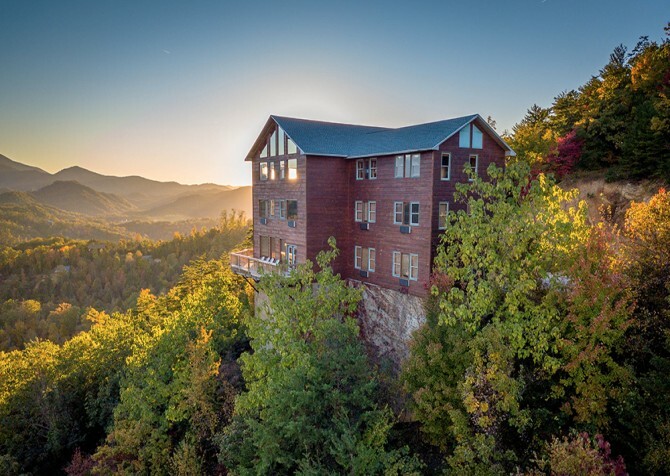 Whethere you want to relax or play, LeConte Bear Lodge is everything you need and more! With space for 50+, this 12-bedroom Pigeon Forge lodge is great for group getaways. It boasts a private indoor pool, movie theater, 2 rec rooms, spacious bedrooms with their own TVs, tons of deck space, double appliances in the kitchen, and more! Perfect for family reunions or retreats, this 6-bedroom, 5 ½-bathroom cabin has room to sleep up to 22 guests. A fully-equipped kitchen and washer/dryer are welcome conveniences, while a big screen TV, DVD player, hot tub, pool table, and high-speed wireless internet provide hours of fun for kids and adults. Gorgeous interiors, fantastic views, and a flat, paved driveway simply add to the appeal! Watch the mesmerizing river dance downstream, soothe tired muscles in the steamy hot tub, whip up tasty meals in the fully equipped kitchen, shoot pool with family and friends, and stay entertained with multiple big screen TVs at this 7-bedroom, 3.5-bathroom, riverfront cabin for up to 17 guests in Pigeon Forge, TN. These cabins perfectly match all of yoursearch criteria except your search dates. Browse these cabins if your dates are flexible. These cabins are available for your dates but don't match all search criteria. Take a look at these cabins if your amenities are flexible. These cabins do not match your desired dates or amenities. View more vacation homes below. 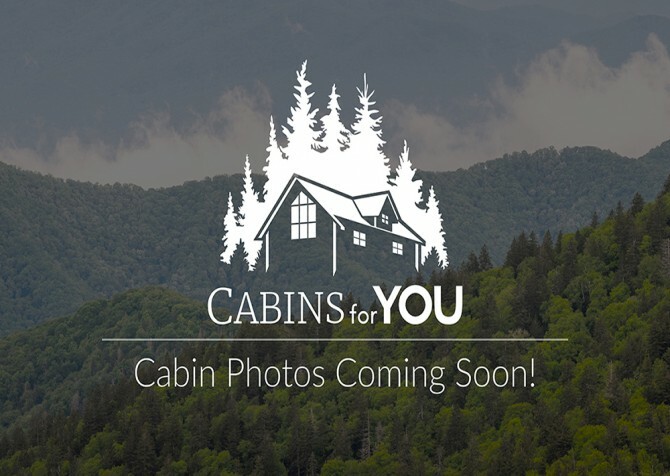 Cabins for YOU is committed to creating your perfect Smoky Mountain vacation. We work hard so you can do what you came to do, make lasting memories. Submit your email to receive a Barry special promo from us to you. After all, Smoky Mountain vacations are always better with a discount!